"Insights about how one type of cancer relates to another form of the disease can have real clinical implications," said Josh Stuart, Baskin Professor of Biomolecular Engineering at UC Santa Cruz and an organizer of the Pan-Cancer Initiative. "In some cases, we can borrow clinical practices from better-known diseases and apply them to cancers for which treatment options are less well defined." Stuart's main collaborators on the pan-cancer analyses have been Christopher Benz, professor of cancer and developmental therapeutics at the Buck Institute for Research on Aging and a clinical oncologist at UC San Francisco, and Christina Yau, assistant adjunct professor of surgery at UCSF and a senior scientist at the Buck Institute. Stuart and Benz are co-directors of the UCSC-Buck Institute Genome Data Analysis Center, one of seven national centers in the TCGA Research Network. Working with an international team of researchers, they performed a comprehensive molecular analysis of the complete set of TCGA tumor data. 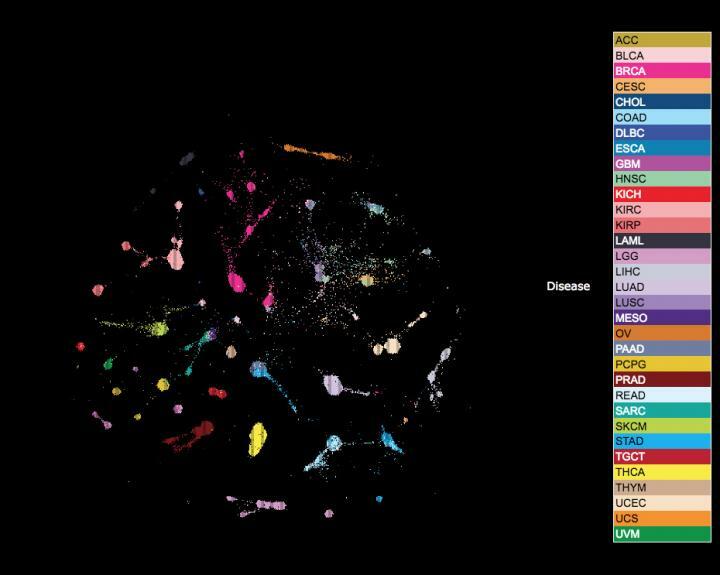 The results showed that, based on their cellular and genetic makeup and independent of their anatomic site of origin, all 33 tumor types could be re-classified into 28 different molecular types, or "clusters." Nearly two-thirds of these clusters were considered heterogeneous as they contained up to 25 different histological tumor types that, traditionally, would all be treated differently. These molecular analyses and clustering results, now also linked to multiple clinical outcome endpoints, are available to clinicians and researchers worldwide via a single TCGA portal. "This comprehensive body of final TCGA Pan-Cancer Atlas analyses will provide a new foundation for future cancer research efforts and clinical trials," Benz said. "It will also incentivize clinical oncologists to get newly diagnosed and recurrent tumors genomically characterized. Patients will have the best shot at successful treatment if their tumors can first be classified according to their genomic and molecular makeup." "It became clear, when we found similarities between different types of cancer, people wanted to do a more comprehensive comparison," Stuart said. Stuart helped organize the 27 Pan-Cancer Atlas papers published April 5 in Cell Press journals. He said the Pan-Cancer Initiative's work so far resembles a giant tree, with roots representing different means of classifying tumors, and sub-roots branching off each of the main roots. This organizational structure provided the basis for "themed working groups," rather than groups based on organ or tissue type. Stuart and Benz are senior authors of one of the papers, published in Cell and led by Peter Laird of Van Andel Research Institute, which provides a roadmap for other researchers seeking to delve into the findings of the various working groups. "It's a survey of what kinds of overarching systems underlie the data. It's less about clinical implications, and more about the patterns we've found," Stuart said. The first authors of the paper include Yau and Christopher Wong, a staff scientist in Stuart's lab at the UC Santa Cruz Genomics Institute. Stuart said he is confident that once scientists start scrutinizing the data, clinical implications won't be far behind. "Obviously, finding actionable pieces of logic from these root maps is the holy grail," he said. "The milestone we hit with this paper is finally being able to stand back and look at the big picture." The UCSC Tumor Map, an interactive browser developed by Yulia Newton and Adam Novak to help researchers visualize the data, displays patient samples on a Google Maps interface. Wong used the browser to compile a set of 10 panels in the Cell paper illustrating the dominant patterns found in the data. These include the cell of origin, molecular histology, "stemness" or differentiation status, specific altered genetic pathways, and the immune system component of the tumors. "Looking at these Tumor Maps is like looking at the Earth from orbit for the first time," Stuart said. "We now see cancer's complete picture and it fills me with hope that we can understand its finite, not infinite, complexity." UC Santa Cruz has a legacy of creating browsers for the biological community, starting with the highly popular UCSC Genome Browser. "We are thrilled to make this rich data available to the public through this new portal," Stuart said. Benz said the new TCGA data hold particular promise for expanding treatments designed to enlist the immune system to beat cancer, including approved immunotherapies now showing near-miraculous results against a limited number of classical cancer types. Remarkably, the study shows that one of the most heterogeneous of the observed 28 molecular clusters was composed of 25 different classical tumor types and exhibited very strong features linked to activation of the patient's immune response. "This finding supports the growing notion that specific immunotherapies approved by the FDA for one cancer type would likely benefit patients with various other cancer types, if these other types could be molecularly identified," Benz said. Drugs approved for other diseases could also be effective against some of the newly classified cancer types. "A couple of our newly defined cancer clusters also show activation of a molecular pathway (JAK/Stat) that's commonly upregulated in rheumatoid arthritis," said Yau, who provided bioinformatics expertise for much of TCGA's work over the past decade. "Perhaps we can repurpose drugs used to treat that non-malignant chronic disease, as researchers will now have the molecular rationale to explore this novel treatment strategy." Even though TCGA is done–the database won't be added to or changed–this same kind of comprehensive and collaborative multi-platform genomic analysis continues nationwide under new NCI sponsorship. Stuart, Benz, and Yau continue to work together as part of their bioinformatic analysis center for the newly constituted Genomic Data Analysis Network which, among other challenges, is tasked with determining clinically measurable biomarkers that would make it easier and more cost effective to identify a priori those same tumor molecular subsets identified by the TCGA network's multi-platform analysis. "It's time to re-write the textbooks on cancer, and it's time to break down the silos in clinical oncology that make it difficult for patients to take advantage of this paradigm shift in cancer classification," said Benz.